Earlier today, we wrote about Antisec releasing some Apple UDIDs to show that it had apparently collected info on 12 million Apple users, which it claims to have found when it hacked into an FBI's laptop. As we noted at the time, the file was called "NCFTA_iOS_devices_intel.csv," which implied that it came from the National Cyber-Forensics & Training Alliance, a vehicle set up to allow companies to share info with the government. 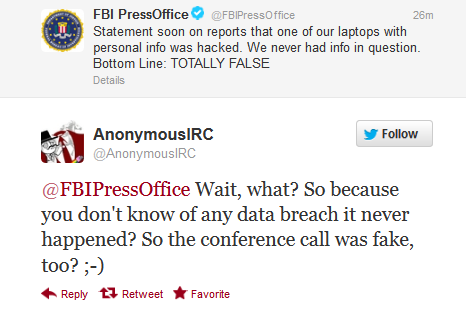 However, the FBI is now flat out denying that any of its laptops had been hacked or that it had the info. Antisec is, to say the least, unimpressed: The FBI's denial comes after an earlier, weaker denial, in which they just said they had "no evidence" to support the story. Now they're saying it's "TOTALLY FALSE" (all caps for EMPHASIS). And, of course, Antisec folks are reminding the FBI (and the public) that they're still sitting on 3TB of additional data from this hack -- which suggests that they're planning to release more to prove that the hack really was of an FBI machine. Either way, now that the fight is happening on Twitter, it seems time to grab some virtual popcorn, sit back and watch the fireworks. And a very fast broadband connection and the owner didn't notice a 3TB upload and no-one else noticed?